The world is not eternal, it can be destroyed. However - what to oppose? You can't die in silense, can't hide from Mors Silens - Mors Certa, Hora Incerta. Not hides in silence of the night, does not hide during the day - it's just Mors Silens, pressing all around by the melody, violating opponents! All we will be near the Gates of Hell. Whether all will go there? Not all, not sure, me - certainly! So many genres and trends intertwined in this composition - that's hard to say, hard to describe thats! Epic monologue begins the Black Pharaoh 2014, crushing heads rhythm continues 'till the middle - where sound accelerates to smach more heads and bones for a bit ... and then monologue finished the track. Dancin' pace changes with melodic guitars in Soul Reaver. Slow pace appropriates the epic speeches with the followers, changes with the fast guitar parts 'till wake up the followers. Midtempo requirement to Garden of Death turns up after joined vocals 'till the bridge. And then the pace changes at the behest of the narrator - from fast steps to acoustic parts with a slow story. The Four Horsemen - Pestilence, War, Famine or Death?! Who's first in this list? 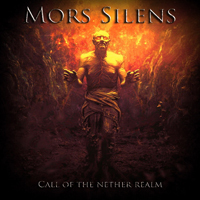 Intro starts to continue next part with the symbolic sounds to Mors Silens - Call Of The Nether Realm . Have faced with Unknown Enemy? Live picture of the battle - and the result? Fled or won?! At an average pace, firmly and powerfully happens Son Of The Burning Sky. That's pace continues in start of Lost In Prison, sounded more slowly but more pressure in it has drop down to your ears. Pulsed beginning of Vengeance Will Be Mine try to keeps your attention 'till the bridge, and then games with pace withoyt any fear. Fast&drive Collapse kicks asses without regret, no remorse in guitar blows for a break in the middle. Acoustic Interlude too short - you have to be ready for the Inner Fear. Or not? If you wasn't ready yet - hear, understand and defeat it forever! The Serpent King - image blurred, incomprehensible and multicolour. We need an overall picture, to understand and sort through ... you have to do that! Deliberately is the story of the God Of Destruction. No sense to hurry - the whole world can wait. Dancing guitar solo at the beginning of the In The Shadow Of Destroyer. God from previous track not managed or doesn't wan to do that? Well, a lot of slotting for the executor and much to showdown he has to done at this world. And that's finished by the melodic part with a scratched monologue. Gods out there, performers - can't be forever: The Day When I Fall, executor's end described that track differently, slightly blown up with a perform of a mighty wishes of a people. When that story started by Intro - have to be finished by the mysterious and inspiring for a lot Outro.